When Your Mom is a Ninja_sk8r_mum . . . When your mom is a Ninja_sk8r_mum you know you’ll get lots of encouragement. Check out the mom’s account to see some rad shots of all her ninjas. And yes Ninja_sk8r_mums do skate themselves. 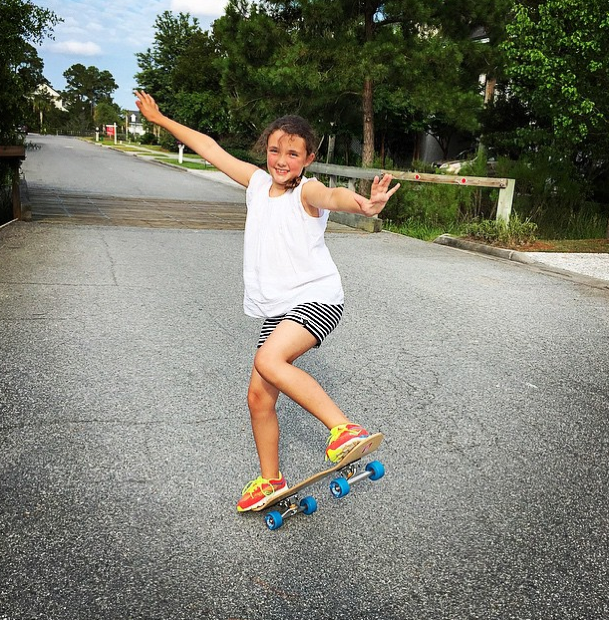 Abagail or abstar_the_nut has skate style and she’s learning new tricks all the time. And as a girl with a blue streak – I have to say I love the pictures where you see her pink hair! Keep being a rad – mother-daughter team your positivity inspires others to get stylish on & off their boards! Oh and by the way does anyone know where to get a Harley Quinn deck? If not I’m sure I know who’ll be designing it herself. I love this picture because I see happiness & pride! And who wouldn’t be happy & proud if they made their own skateboard and then got to skate it 24/7. Shout out to the parents & teachers who encourage creativity. 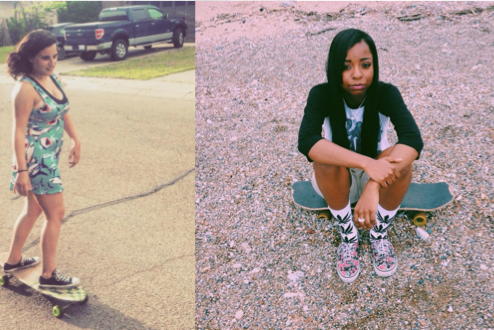 True style is always evolving so be creative on & off the board! Remember to share your skateboarding stories – let your joy be someone else’s inspiration! Hi – it’s me on Sunday June 28th headed to Woodward West for a week of skateboarding fun. I’m overwhelmed by all the support I’m getting from girls willing to help me get more girls skateboarding for fun. And lucky that my mom will put my posts up for me while I’m gone. Encouragement is so stylish – keep being rad on & off the board & if I see you at Woodward West this week – I’ll get your pic with my HTC – the camera on my Desire is all that & more – just check my pictures out on my Instagram! 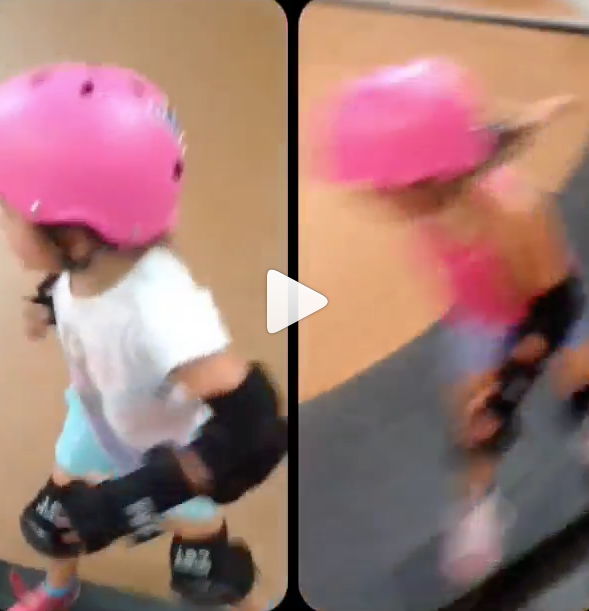 This is Sophia and Stella – they are sisters learning to skate together with help from @shane_sheckler & @kane_sheckler – in this video they were kick turning. In another video Sophia is dropping in . . .
. . . watch the video – she does it by herself. Yes he’s there – offering encouragement. 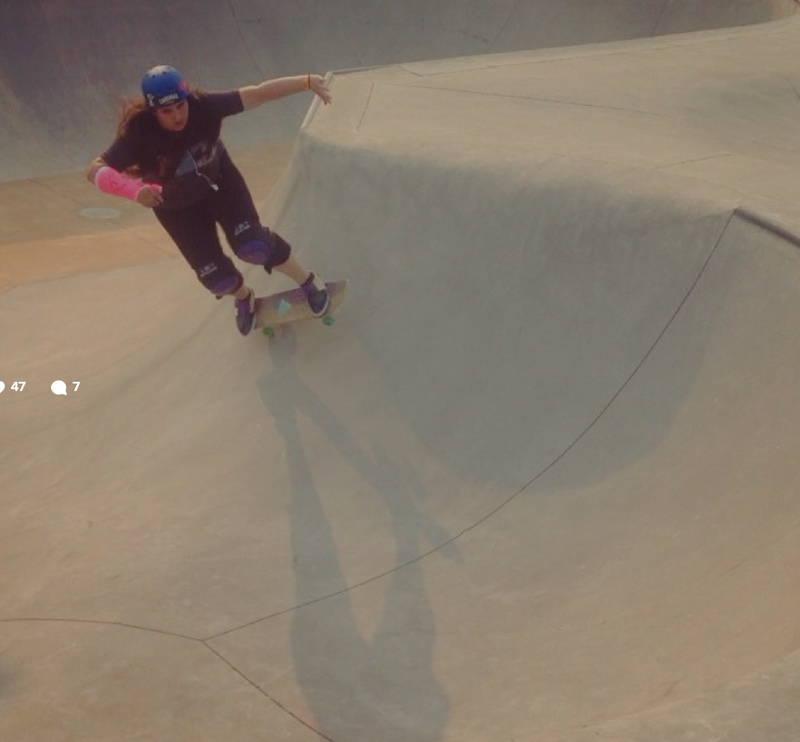 I would not be skateboarding today without encouragement and that’s why it’s important to share pictures of girls skateboarding for fun and getting encouragement because that’s what makes more girls start and keep skateboarding. There are always going to be haters – don’t skate with them. Keep it stylish on & off the board by surrounding yourself with positive people who encourage and look out for you! 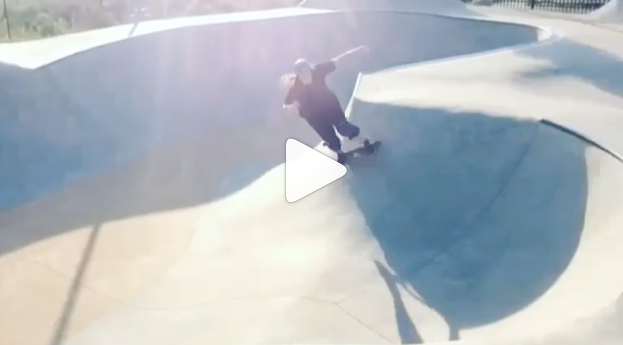 I had to share this because a skatepark that supports girls – that’s my kind of park and a girl who doesn’t give up is my kind of girl. Our story doesn’t end here – she’s back skating & . . .
. . . landing it with her new accessory – pink cast. Since I’ve started this blog – I’ve seen so many rad photos and stories of skateboarding helping girls become stronger people. It takes strength to face your fears – her fear was real she slammed – she faced it anyway and figured out how to land it. In life your first try won’t always be successful – learning not to give up and try it a little different – that’s a stylish skill on & off the board. 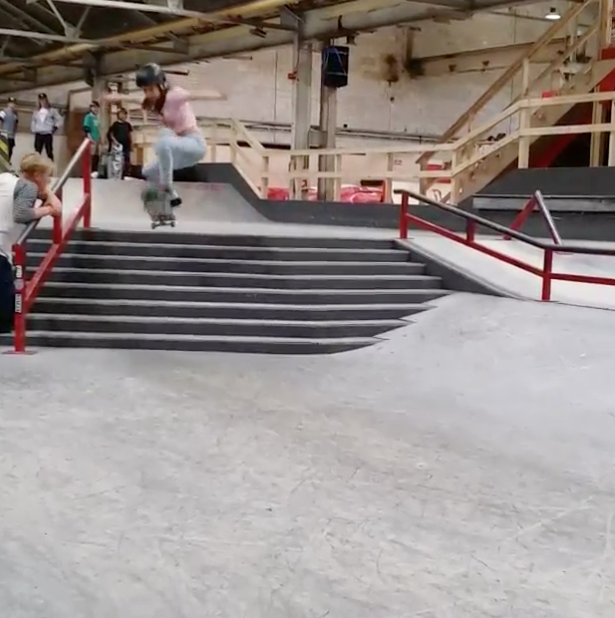 Falling is NOT failing – it’s totally rad that she’s this young and gets that! If you can face and deal with your fears your life on and off the board will be much happier. As for skateboarding in the house – it’s good to become “one with your board” so bond with it where ever and when ever you can! The power of encouragement is huge! When you’re encouraged, you feel stronger. It gives you the courage to do things you thought impossible. The greatest gift we can give each other is encouragement! 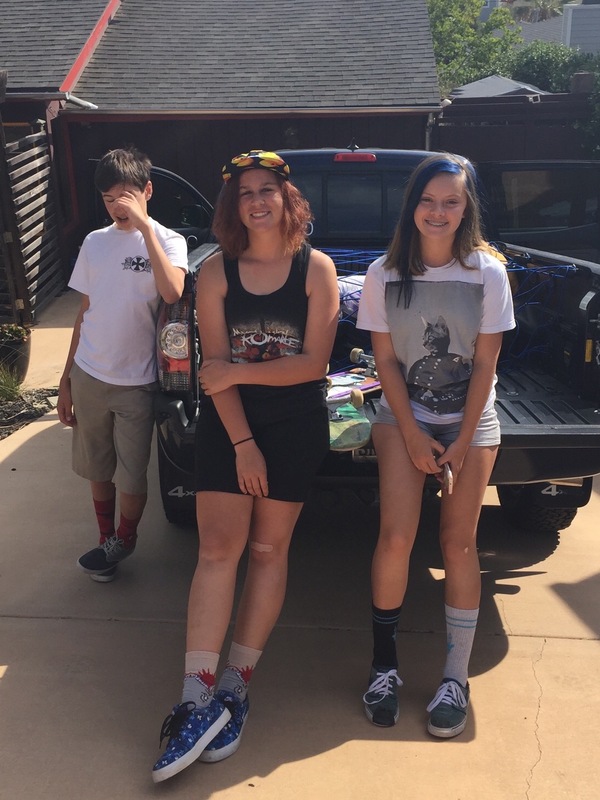 Thanks Freya & Ellie by sharing you encouraged so many – including me! Best Way to Spend a Break? Love this picture – now some may say she’s not skateboarding she’s just riding & it’s motorized, & . . . . There will always be haters – people who look for what’s wrong! I’m challenging everyone to look for what’s right – her smile! 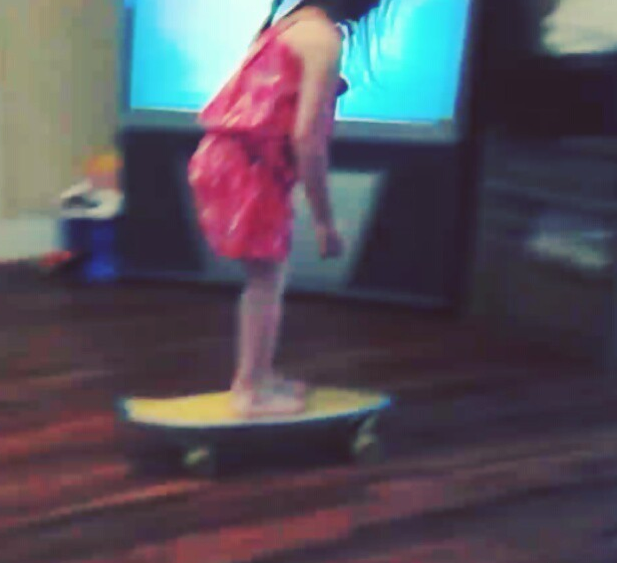 Do I think she’ll skateboard by herself one day? 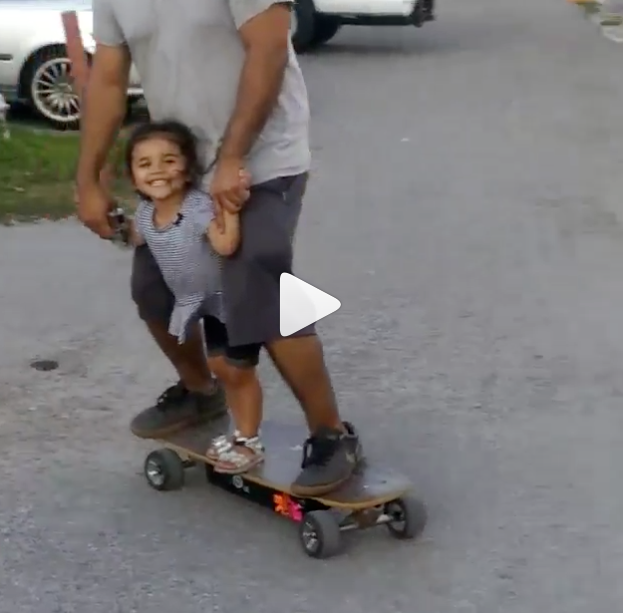 Yes, because tackling your fear of the board is huge & my girl doesn’t look a bit afraid. Till next time – keep it fun & keep smiling on & off the board! 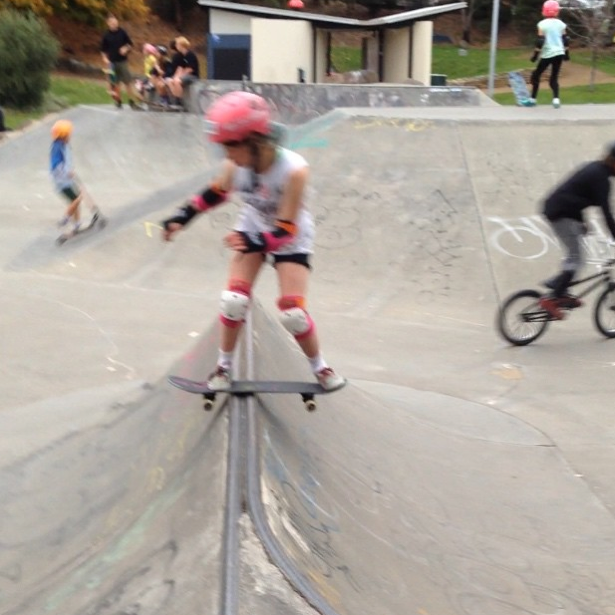 Some girls were skateboarding alone – don’t feel sorry for them – they’ve already found skateboarding. Let’s show other girls so they can start skateboarding too! 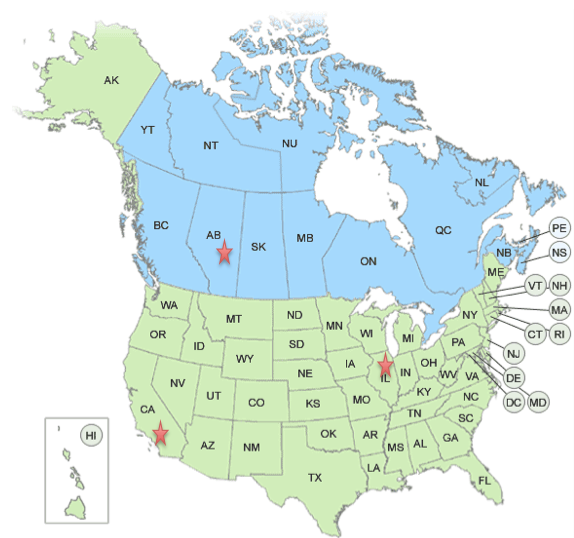 On the left – head north to Canada to meet eggthemoonpig! On the right go east and south back to the USA in Chicago, IL to find Alicia Marshall who is busy with her music, modeling, dancing, photography, and promoting but still makes time to skate! Everyday we find more & more skater girls – keep sharing your pictures – together we encourage each other to skate and keep it stylish on & off the board! This is Bridget and she does yoga and she skateboards! On Go Skateboarding Day just want to be thankful that there’s no one way to skate. Skateboarding is as creative as you are. So however you skate keep skateboarding. Keep skateboarding fun & keep sharing your pictures – more girls sk8 as they see girls sk8 & encouraging others is good for them & you!